SMALL Scale Mining activities in Wau/Bulolo district of Morobe Province have contributed K4 million to the Government in terms of revenue. Mineral Resources Authority (MRA) Small Scale Mining branch manager Al Comparativo told small scale miners when presenting mining lease licenses to lease holders at Misis Booth near Wau last Saturday. Mr Comparativo said the revenue should increase to K1 billion through approved mining licences. The lease license number 270-277 was handed over to the mining lease holder Westie Awiong. "I congratulate Awiong for being granted a mining licence by MRA to conduct proper mining operations after meeting all the small scale mining lease requirements. "There are more than 124 mining licence applications waiting to be processed by MRA and four (4) mining licences had been granted. 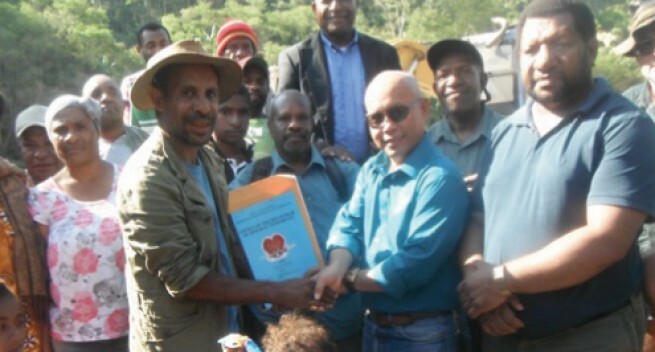 Three lease holders are from Wau in Morobe and one from Milne Bay Province," he said. Comparativo said the process of acquiring a mining lease is long and the mining lease holder must meet all the regulatory requirements by submitting a detailed survey report, development plan, compensation, environmental plan and financial capacity reports and submit it to MRA for its screening and approval. He explained that Mr Awiong had met all the requirements and had been granted the mining licence by MRA to conduct mining operations at the ML 270-277 at Misis Booth in Wau. The Philippine graduate geologist who spent 17 years in PNG said Wau/Bulolo had a long mining history during the colonial era and it should be restored back to its former glory as the leading and historical mining town in PNG, now and into the future. Mining lease holder Mr Awiong thanked MRA for granting him the mining licence and also his partner Wabu Alluvial Mining Ltd for entering into a joint venture partnership agreement with him to help to get the alluvial mining project off the ground in Wau. I am grateful and honoured and thank MRA and JV partner Wabu Alluvial Mining Ltd for providing financial assistance to get this project off the ground," a delighted Awiong said. "I also encourage other small scale mining lease holders in Wau/Bulolo to follow the legal process to obtain the mining licence to venture into mining operations."